So here we are back at home for the first week after our French spring migration. We’re just about getting back into life @ home. A part of getting back into it for Carol is for her to tromp off on Wednesdays to do volunteering work with the Greensand Trust. Like a good green-minded volunteer, off she set on her bike just before 10:00 AM. I was left to cycle into town on an emergency mission, a dash for freshly roasted coffee, our supplies of which were getting dangerously low. Just as I was arriving back chez nous, my mobile began ringing. The fact that I’d a) got it turned on, and b) got it off silent mode was very fortuitous. On her way to meet her fellow volunteers, Carol had cycled past a little brown bundle in the country lane she had chosen to use. Curiosity piqued, she spun around and retuned to find that the little brown bundle had moved onto the grass verge. The little brown bundle proved to be a little owl. It was holding one wing out as though damaged. The ranger in charge of the day’s volunteering tasks is a keen birder, one who has recently been out to Malta monitoring the outrageous Maltese migration massacre. Carol returned again, this time with the ranger and collected the hapless little bird. Experienced eyes determined that the bird was partially fledged – it seems owls leave the nest before they can fly properly – and certainly had a broken leg, though it was able to move the wing so perhaps that had been knocked and bruised. Little Owls are known to nest along that lane and this had perhaps fallen. Useful trick: tip a bird on its back and cup it in your hands and it’ll just lie there wondering what to do. This is how Carol got the casualty back to the group. It’s not everyone that gets to cuddle a baby Little Owl. Mr Ranger went back to base for a cardboard box and some padding in the form of a lost property rugby shirt. 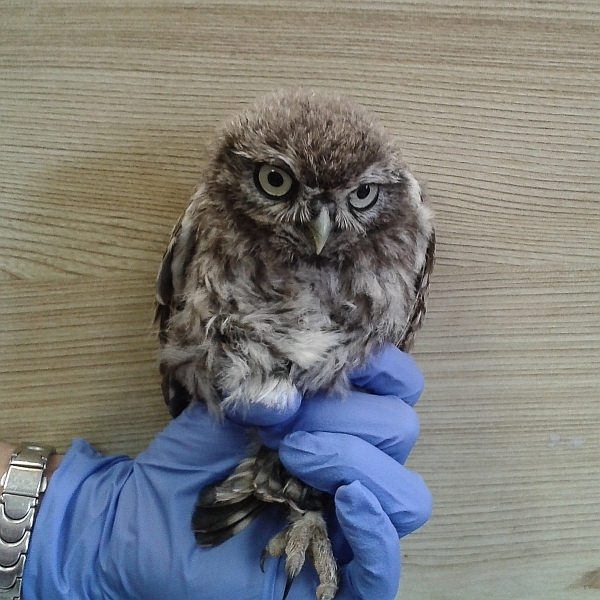 He contacted Tiggywinkles Wildlife Hospital at Haddenham who agreed to take the owl in. Carol phoned me in search of an ambulance service. I had been intending to head out to check on dragonflies at our local nature reserve but this was much more exciting and important. I quickly set off. Checking that the box contained Little Owl that was still in the land of the living, we loaded Carol’s bike on the car, and Carol with her Owl in a box in the car. Our precious cargo arrived safely at Tiggywinkles just before midday and posed for a farewell snap, albeit in a rubber-gloved hand, before being checked in.